To create the longest possible cut closest to Romero’s shooting script. This is an idea I’ve had for a fan edit for years. I first heard about the Argento cut having exclusive footage around 1999. It wasn’t until 2004 with the release of Anchor Bay’s “Ultimate Edition” that I finally saw Argento’s version. I finally started working on this in fall of 2007 on a whim. Principal editing began around September/October, and was put on hiatus. Production resumed around December 2007 through January 2008. Like I’ve also said, while Romero’s 126 minute cut is my preferred version, I still wanted to create this cut to piece together somewhat of a “glorified workprint”. Countless extra snippets throughout the Argento cut were added to the 139 minutes Cannes cut. These include a few extra headshots in the mall sequences, as well as various dialogue extensions, such as the bikers in the finale planning their “attack strategy” (“One by one, they’re gonna knock you off your little bikes”). One full scene which was previously cut and added back in is a bit of dialogue between Peter and Stephen after they return from “shopping” the first time. Stephen acts cocky while Peter wants him to realize just how lucky they were. This scene contains the line “Let’s say the lady gets killed… you’d be able to chop off her head?” which was used in the English language Italian trailer. This is the only version I will ever watch. Fantastic transfer. Fantastic job. If you loved this movie for as long as I have, seeing it in a whole new light is wonderful, and inspiring. In fact re-locating this version recently, lead me to this forum, and lead me to try my hand at re-editing myself. Great job, great picture, great movie!! Already watched this twice already. I’m glad this was made because I can still remember seeing film for the first time 11 years ago when I was a wee lad of 16. Stayed up until 2:30am to finish watching it. I never stayed up late like that when I was that age. This movie pulled me in THAT MUCH. I can still still remember jumping out of my bed and getting all excited when one of the main characters had a sudden change of heart (no spoilers here). Upon finding out that the version I had seen was the “director’s cut” and that there were 2 other versions, I knew I had to see it. 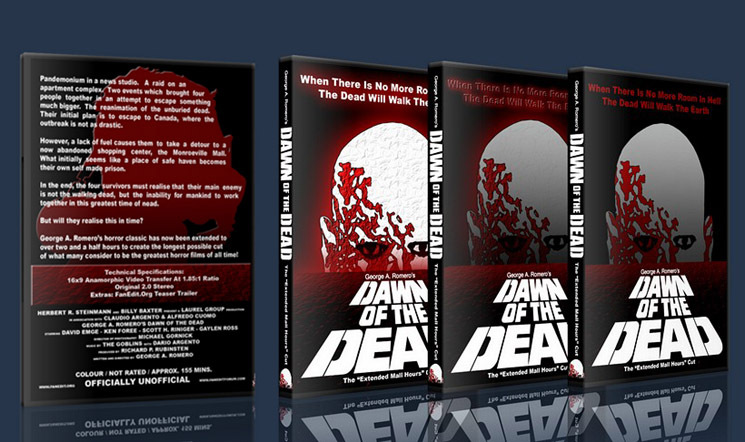 I never saw the Argento version until the 4 disc DVD set. I said “hopefully someone finally goes and puts the footage from all 3 together to make the longest running cut of the film”. And now, I finally have it. Before this, there were bootlegs circulating on ebay that were vhs (and probably bad editing to boot). That being said, this is my preferred version now. My only problem with it is, since I’ve seen the Director’s cut about 8279 times, I’m so used to the music in that version, that this one will take some getting used to. 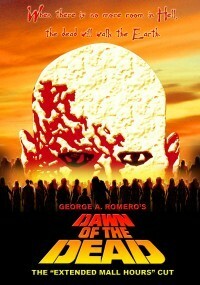 This is an absolutely excellent version of Dawn of the Dead, in fact I think it’s vastly improved over the Cannes cut. All the footage has been blended in with the original. It’s obvious one or two times when there’s something added, because the colour shifts, and this is especially noticeable during the opening sequence with repeating titles, but honestly it doesn’t matter – it’s not at all distracting from the film itself.